Britain emerged from World War II dependent economically and militarily upon the US. Egypt was the hub of Britain's imperial interests in the Middle East, but her inability to maintain a large garrison there was clear to the indigenous peoples. These essays track the decline of the empire. 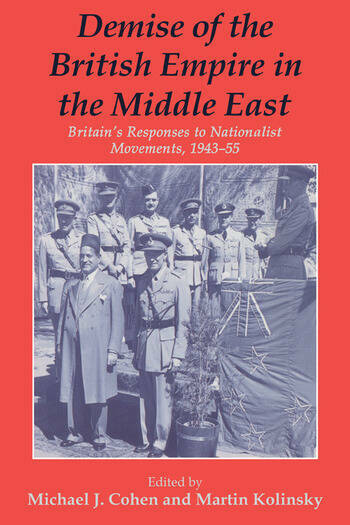 The Jerusalem Post -"In this excellent historical resume, a dozen British, American and Israeli scholars, including the editors, examine Britain"s relations with Egypt and the Arab league, its miscalculations in Iraq and Jordan and its inability to resolve the Palestinian question." Imperial and Commonwealth History-" As a whole, Cohen and Kolisky"s Demise of the British Empire in the Middle East provides a penetrating set of essays which throw much-needed light on the reasons for Britain"s fall from pre-eminence in the ten years following the end of the Second World war." "The collection covers old ground, but it does so with new documentary material and some interesting interpretations." Twentieth Century British History- " It offers a wide-ranging and informative collection of articles which should prove of interest to readers of British and Middle Eastern history, politics and economics.